Our home is quietly nestled in the foothills of the Appalachian mountains near Jasper, Georgia. We have set out to create a home that our residents will feel is their own. The transition from living at home alone to living in a small community can be difficult for both the seniors and their families. Our personalized care for each individual allows them the freedom to make choices that will ease the transition. We provide a high level of service with a personal and caring touch. 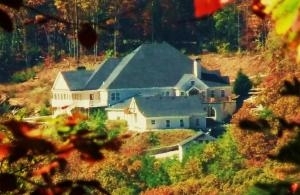 Serenity Mountain Manor is family owned and operated. It is our goal to hire and keep staff that share our Christian values and morals. Enjoy life with the support you need along with the appropriate accomodations as your needs change. Sit on your back porch and breathe the crisp, clean, mountain air while enjoying the breathtaking mountain views. Take a stroll through the indoor courtyard and listen to the calming sounds of our waterfall. Relax in the jacuzzi hot tub. Enjoy new and classic movies in the theater room, or dive into one of our many tailored activities. Build lasting friendships over one of our delicious home cooked meals. We welcome you to come and experience the joy and hospitality we offer here at Serenity Mountain Manor.